"It's not just love for music, it's my passion. It goes beyond liking, and beyond a hobby. It's about a way of living. Music is essential to my life. " This comes from one of the most famous DJs in the world, the great Armin van Buuren. But this, could be YOU. You've been playing for long and now it's time to get down to business. Sell your own music. Online.Because the facts speak for themselves: 45% of the whole industry sales come from digital productsand streaming revenues have been jumping up to a +45.2% since 2014. Well, maybe you're asking yourself: "How on earth can I do this "? First, you should start using iTunes to sell music in your country, and then anywhere else in the world! You'll end up telling friends: "I can sell my songs on the iTunes Store, you know what I mean? ". But wait, there's a better way to improve sales and get people to know your talent: you should create an e-commerce site and start selling music on your own, with no legacy. By using this strategy not only you can reach thousands of iTunes users, but you can also start your own online store. The place to show exactly who you are and why you play your music. Likes and shares, views and downloads are already running through your mind. Because music is like water, it either flows or dies. Now's the time to take action! Follow our step by step guide and get ready to win all digital stages! How to sell your music on iTunes? How much will iTunes charge for music? How to promote music on iTunes, social media and dedicated sites? This is about selling music without any go-between. The main advantage is that all the incomes and royalties will go into your pocket. However, selling music on the iTunes Store is no easy drill. There are many requirements to meet and procedures to stick to. 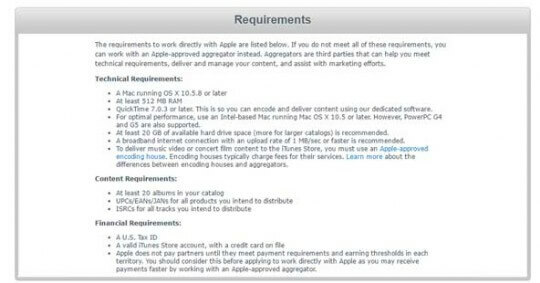 To visit the Requirements page, you should apply to iTunes Connect. First, some technical requirements. You need a Mac running OS X 10.5 or later, at least 512 MB RAM and 20 GB hard drive space. If you're a Windows user, no worries: you can work with an aggregator to easily prepare and distribute your tracks. If you're lazy, find someone on Fiverr that can do it for you at a small price. Second, you need an Apple ID. Third, get a TIN (Tax Identification Number). The Tax Code is a compulsory document if you wish to sell in the US. You can easily get it online from the IRS official website. If you have a VAT number, ask for an EIN code and fill in the SS-4 form. If you don't have a VAT number, you should ask for an ITIN code and fill in the W-7 form. Fourth, you've got to have an EAN or UPC code for each CD you want to distribute and an ISRC codefor each track you want to sell. UPC stands for Universal Product Code and it's the barcode displayed on every CD: you can contact GS1to apply for one. ISRC is the International Standard Recording Code that goes with every track. Does it matter? Yes, because Nielsen SoundScan system uses ISRC. And SoundScan is the source for no less than the Billboard music charts. Get it? Fifth, register on iTunes Connect as an iTunes Content Provider. To become an iTunes Content Provider, the last step to take is having at least 20 albums in your catalog! In other words, if you're not a long-running band like Coldplay or a record company, you're stuck. Luckily enough, you have another option! In fact, you can upload your music on iTunes through an aggregator - or digital distributor. There are so many! In 2017, the official Apple list counts 51 of them. Selling music on iTunes through aggregators is easy and quick. You can upload your music once and have it released in digital stores in no time. The best known aggregators are Distrokids, CDBaby, TuneCore. They all have a pretty easy-to-use interface: in 10 minutes or less you are all set to publish your songs. Anyway, it's time to understand what you get with them and, above all, how much it will cost you. How much will iTunes charge for your music? Saying you are not selling directly on iTunes, prices are different for every aggregator. To help you pick one, you can find the main Apple-approved aggregators here in this table, that also provides details about their service. pay a yearly or monthly fixed rate, with no commissions on what you actually sell; TuneCore and SongCast work in that way. pay a commission on the songs you sell, like Wondermark's pricing model - it's rarely the case, though. pay both a fixed rate and a commission per sale; you'll easily have that kind of pricing system, especially with aggregators like Distrokid or CD Baby. Scrutinize prices and take time to rationalize - like folk singer Helen Austin. Make sure you've done your sums right, like how much material you actually want to upload through digital stores. Only then you'll be able to make the best decision in terms of pricing. 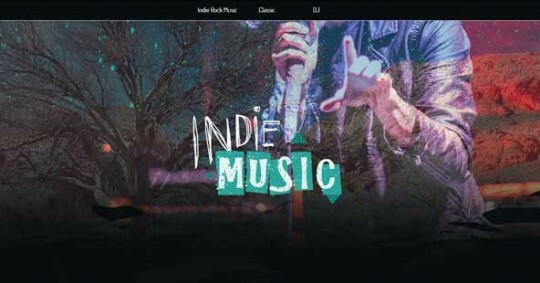 Which are the associated digital stores? Look at the numbers and at the genres too. For example, if you're a DJ, Beatport is a must. When will you get paid? In some cases you'll receive your earnings once a month. In some other cases money will be available right away.strong>How often will you receive a report on your sales? It varies from distributors to distributors. You can get a monthly, daily or weekly report. Take a look at the FAQ, or at the support page on their official sites. You could also try and send your questions to the customer service. This way you'll test their response time and see which kind of support they provide. Obviously, this is just a first move to let your future fans discover your music. After you've uploaded your tracks on iTunes, your slot is secure. It's all about catching the users' attention now. To be clear: they need to FIND you. Where? On your website, of course. Ok, so you think that running your own website could be really complicated? Or maybe you take for granted that, just because your song is now on iTunes, everyone will go there and get it. In any case, remember: on all these platforms you are a guest and you must stick to their rules. If they decide to shut you down overnight, there is absolutely nothing you can do about it. While with your own website, you've got full control and you keep 100% of incomes for yourself, which is no small thing! Even a very simple one-page website with an appealing look can perfectly rise to the occasion. You have to select a suitable template and plan your site to display yourself and make the most of your sales. The right e-commerce for an artist must contain the following information and contents. Your biography. Who are you, what do you do, where do you live? Your music. If you want to display technique and heart, passion and artistry, this is the right section to do it. Your events' calendar. Keep people posted about your shows. Contacts. Get people to write or call you. Store. This is the section to purchase your tracks. Run it very carefully and draw inspiration from the best ecommerce sites. Would you accept some advice? Post your best tracks and allow free listening. Select images accurately. Always include some explanatory lines. Define your genre. Make sure your web page is user-friendly. Listening to songs, adding them to cart and purchasing should be immediate and easy. What comes next? Promotion! Do you remember what we said before? Music is like water, it either flows or dies. You've got all it takes to spread your music around. A website, as good as it should be, an account on the main stores... What now? Promotion, yes. But how to promote your music on iTunes, on social media and dedicated sites without being a spammer? What you need here is some creativity and planning skills. Imagine you have your track ready. It's time to get it out of the rehearsal room to the whole world. Here's an example of a 5-stage strategy. Stage 1: schedule when the track will be ready and mark your calendar. Stage 2: decide when you want to release the track. To choose well, search around the web for information and statistics on the international music scenery. Stage 3: involve your fans, show them your backstage work through Instagram Stories, enhance their expectations on your upcoming tracks with some YouTube videos. Wish to do more? Go for some guerrilla tactics! Get out of your studio and meet the crowds. Walk in the streets, step in the stores. Give away some USB sticks with your song preview. Be original, be funny. Results guaranteed! Stage 4: set up a playlist of your gigs and ask to the event organizers or to the venues managers to arrange some public interviews. Stage 5: scrutinize, rationalize and start again. Study your web analytics and reports from the other online stores. Which are the channels where people buy your songs the most? Which time of the day does it happen more often? Are your fans mostly men or women? How old are they? Answers might surprise you and suggest you how to optimize your work. Now you know exactly what to do and how begin selling your tracks on iTunes. You don't need to do everything at once. The important thing is: make it easier to purchase your songs, for those who already know you and appreciate you. Make it easier to find you out and remember you, for those who don't know you yet. Break a leg!